Get a fast, conversion-focused WooCommerce theme in 2019. Switch to Shoptimizer. Handpicked articles on how to plan your eCommerce store, launch your business and optimize conversion rates to grow revenue rapidly. An elegant WordPress and WooCommerce theme designed to make your store stand out from the crowd. Build your site in minutes with an award winning page builder included. Recreate the demo site with one-click! Within minutes you'll have a distinctive, stylish site for your business, matching your brand colors. Whether you're a pro or a beginner user, everything you need to build a stand-out site is included. And we mean it. You've never seen so much power in a theme that is this easy to work with. You'll love our theme options! We've built this theme with mobile devices in mind — it looks fantastic and is quick to navigate on tablets and phones. We have you covered with a beautifully designed implementation of the most popular eCommerce platform in the world. 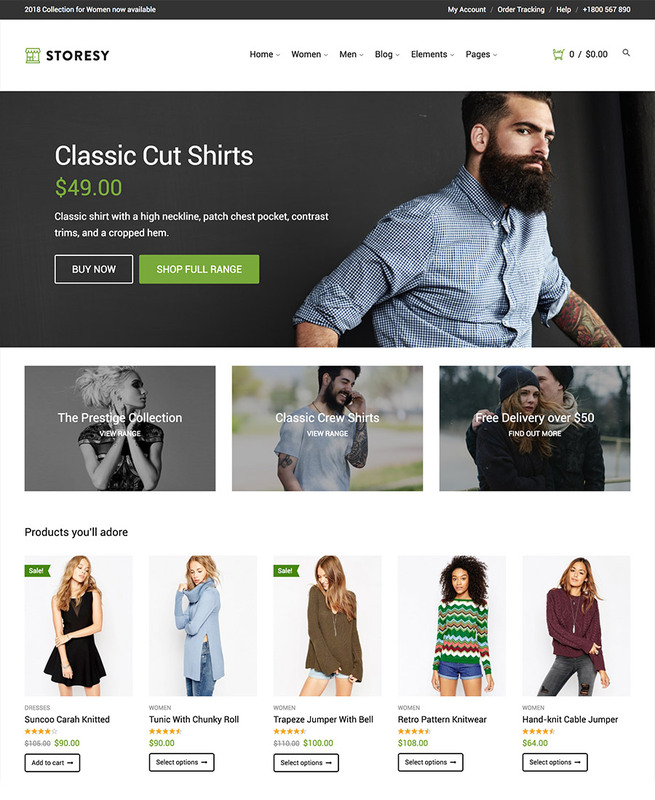 Storesy is a stylish WooCommerce theme, suitable for any kind of store. There are a number of homepages and inside templates included within the demo data. This gives you a great start when setting up your own shop. With a hundred theme options, customizing it to your liking is easy! With crisp, bold typography and a memorable default color scheme your store website will look fantastic with this theme. It’s easy to quickly recreate a website similar to our demo site in minutes using the theme’s one-click installer. With Visual Composer and LayerSlider all the tools are at a customer’s disposal to build a great shop. Don’t waste hours reading manuals to get up and running – get a website built faster so you can start selling today. The product listings page is beautiful with sharp product images. There is also an easily customizable sidebar. Drop in any widget you desire. These can include categories, price filters, a top rated products section and much much more. Storesy is fully compatible with the leading SEO plugin on the market, Yoast SEO and passes Google’s Structured Data Testing Test Tool. Plus, when you do need help we’re here for you. Our customers rave about our support team. The product details template looks beautiful out of the box. Zoom in on an item for a closer look and share it via social media. Add delivery and returns information via the extra tab we’ve included. This is the second theme we bought from CommerceGurus (the first one was Adrenalin). Great theme, and the most important for us - Awesome support! What will I need to use this theme? Things are quite easy – you just need a domain and a hosting service. We highly recommend SiteGround for both. Then, you install WordPress (self-hosted). Now you are ready to install the theme. Do I need to be an experienced user? Not at all! Our themes will let you build amazing sites in no time. No coding knowledge required. No design knowledge required. Even if you're new to WordPress you'll be able to create a professional looking site on your own. Do I get theme updates? Yes! We frequently release updates with improvements and new additions to the theme. You can be sure your theme will be up to date with the latest versions of WordPress. Will the theme be SEO optimized? All of our themes are built and designed with an SEO ready structure and are all compatible with the popular Yoast SEO plugin so Google will love your site. Are the demo images included? The images used in the main theme demo are replaced by grey placeholders to ensure that the demo data imports quickly. They are mostly sourced from shutterstock.com and cannot be included for legal reasons. We pride ourselves in the support we give! You'll be corresponding with us, the makers directly and we typically reply to tickets within 24 hours – you’ll be in very good hands! Get our latest eCommerce articles, updates, and special offers.